THE popularity of these Sketches has been attested by the sale of seven Editions since their first publication. But though the work is admitted to take rank with White's Selborne and Walton's Angler, no attempt has hitherto been made to illustrate the scenes, anecdotes, and ferae nature so graphically described by Mr. St. John. This want—to which attention has often been called—it is the object of the present Edition to supply. In Mr. Cosmo Innes's Memoir of Mr. St. John, he gives the following amusing account of his first interview with him—an interview which led to the first publication of Wild Sports:— "I became acquainted with Charles St. John in my autumn vacation of 1844, while I was Sheriff of Moray. We had some common friends, and messages of civility had passed between us, but we had not yet met, when one day in October I was shooting down the river-side and the islands in the Findhorn, making out a bag of partridges laboriously. "It was a windy day, and the birds going off wild, spoilt my shooting, which is at best uncertain. While I was on the island, two birds had gone away wounded into a large turnip-field across the river. I waded the river after them, and was vainly endeavouring to recover them with my pointers, when a man pushed through the hedge from the Invererne side, followed by a dog, making straight for me. "There was no mistaking the gentleman—a sportsman all over, though without any `getting up' for sport, and without a gun. I waited for him, and on coming up, he said he had seen my birds pitch, and offered to find them for me, if I would take up my dogs. When my pointers were coupled, he called Grip,' and his companion, a large poodle with a Mephistopheles expression, began travelling across and across the drills, till suddenly he struck the scent, and then with a series of curious jumps on all fours, and pauses between, to listen for the moving of the bird, he made quick work with bird No. 1, and so with No. 2. I never saw so perfect a dog for retrieving, but he was not handsome. After this introduction, St. John and I became frequent companions." The acquaintance thus begun ripened into a lasting friendship, and at Mr. Innes's instigation, Mr. St. John was persuaded to note down some of his varied experiences of sport and anecdotes of animals. "At that time," continues Mr. Innes, "I was in the habit of writing an article occasionally for the Quarterly, and I put together one on Scotch sport, using as my material some of St. John's Chapters, especially the story of the Muckle Hart of Ben-more. The paper pleased Mr. Lockhart. It would be sufficient,' he said, to float any number . . . whether the capital journal laid under contribution be your own or another's I don't know, but every one will wish to see more of it.' I received the Editor's letter at Knockomie, and the next day the reading of it to St. John served for seasoning as we took our shooting lunch together beside the spring, among the whins on the Brae of Bervie. Our course was now plain. I divided the money produce of the Quarterly article with St. John, who rejoiced greatly in the first money he had ever made by his own exertions, and on my next visit to London I arranged for him the sale of the whole Chapters, the produce of his last winter's industry, which Mr. Murray brought out in the popular volume of Wild Sports and Natural History of the Highlands." Great pains have been taken in illustrating this Edition accurately, to enter into the spirit, and where possible, to depict the actual scene of the events described in the text. Highland Lakes — Steam-boats — Small Lochs — Wild Cats — Ravens — Dragging the Lake — The Crea — Fishing at Night — Pike — Trolling large Trout on Loch Ness — Flies, Otters, etc. — Fishing with the Otter — Spawning Trout. Roe: Mischief done by — Fawns — Tame Roe — Boy killed by Roe — Hunting Roe: Artifices of — Shooting Roe — Unlucky shot — Change of colour — Swimming — Cunning Roe. Grouse's Nest — Partridge Nest — Grouse-shooting — Marten Cat — Witch: Death of — Stags — Snaring Grouse — Black Game: Battles of — Hybrid Bird — Ptarmigan-shooting — Mist on the Mountain — Stag Unsuccessful Stalking — Death of Eagle. The Wild Cat: Strength of; Rencontre with — Trapping tame Cats: Destructiveness of — Poisoning vermin — Trapping vermin. Poaching in the Highlands — Donald — Poachers and Keepers — Bivouac in Snow — Connivance of Shepherds — Deer killed — Catching a Keeper — Poaching in the Forests — Shooting Deer by Moonlight — Ancient Poachers. Salmon-fishing — Salmon ascending Fords — Fishers — Cruives — Right of Fishing — Anecdote — Salmon-leaps — History of the Salmon — Lampreys — Spearing Salmon — River Poaching — Angling — Fly-making — Eels. Short-eared Owl: Habits of — Long-eared Owl — Tame Owl — White Owl — Utility of Owls — Mice —Rats: Destructiveness of — Water Rats: Food of — Killing Rats — Rat-catchers. Crossbills: Habits of; Nest — Snowy Owl — Great-eared Owl — Hoopoe — Shrike — Tawny and Snow Buntings — Lizards — Singular Pets — Toads: Utility of; Combats of — Adders — Dog and Snakes —Large Snake — Blind-Worm. On the Peculiarities and Instinct of different Animals — Eggs of Birds — Nests — Feeding habits — The beaks of Birds — Wings of Owl — Instinct in finding Food — Ravens — Knowledge of Change of Weather — Fish. The Eagle: Habits; Greediness; Anecdotes of; Killing Eagles; Trapping; Food of — The Peregrine Falcon: Manner of Hunting — Tame Falcon: Anecdotes of — Guinea-Hen and Ducks — The Osprey —The Kite: Trapping — The Buzzard: Nests and Habits of. The Hen Harrier: Destructiveness to game; Female of — Trapping — The Sparrowhawk: Courage of; Ferocity; Nest — The Kestrel: Utility of — The Merlin: Boldness — The Hobby — Increase of small Birds. The Otter: Habits — Catching of — Shooting — Attachment to each other — Anecdotes — Fish killed by. Weasels — Ferrets: Fierceness of — Anecdotes — Food of Weasels — Manner of Hunting for Prey —The Stoat: Change of Colour — Odour of — Food of — Their catching Fish: Polecat — The Marten Cat — Habits — Trapping — Eating Fruit — Activity of: Different Species. Anecdotes and Instinct of Dogs — Anecdotes of Retriever — Shepherds' Dogs — Sagacity — Dogs and Monkey — Bulldog — Anecdotes of Shooting a Stag — Treatment of Dogs. Increase of Wood-Pigeons and other Birds — Service to the Farmer of these Birds — Tame Wood —Pigeons: Food of — The Turtle-Dove — Blue Rock-Pigeons — Caves where they Breed — Shooting at the Rocks near Cromarty. Wild Ducks: Edible kinds of — Breeding-places of Mallards — Change of Plumage — Shooting —Feeding-places — Half-Bred Wild Ducks — Anas glacialis — Anas clangula: Habits of — Teeth of Goosander — Cormorants — Anecdotes. Birds that come in Spring — The Pewit: Pugnacity; Nests of; Cunning — Ring Dotterel — Redshank — Oyster-Catcher: Food; Swimming of ; Nest — Curlew — Redstart — Swallows, etc. Sheldrake: Nest; Food — Teal: Breeding-places; Anecdotes — Landrail: Arrival of — Cuckoo — Nightjar: Habits of — Quail — Grebe: Arrival; Account of Nest and Young — Baldcoot — Water-Hen —Water-Rail. Wild Geese: Arrival of; Different kinds of; Anecdotes of Shooting Wild Geese — Feeding-places —Wariness — Habits — Breeding-places — Blackheaded Gull — Birds that breed on the River-banks. 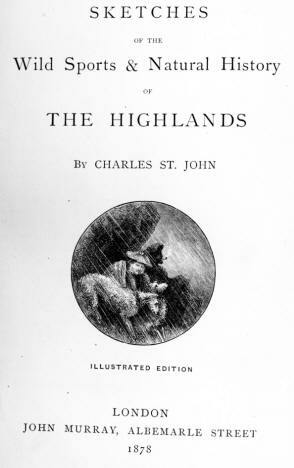 The Sandhills of Morayshire: Description of; Origin of — Foxes: Destructiveness and Cunning of; Anecdote of — Roe-hunting in the Sandhills — Anecdotes. Death of my First Stag. The Findhorn River — Excursion to Source — Deer-stalking — Shepherds — Hind and Calf — Heavy rain — Floods — Walk to Lodge — Fine Morning — Highland Sheep — Banks of River — Cottages. Findhorn River — Bridge of Dulsie — Beauty of Scenery — Falls of River — Old Salmon-fisher —Anglers — Heronry — Distant View — Sudden Rise of River — Mouth of River. Migration of Birds in October — Wild Swans: Pursuit of; Manner of Getting a Shot; Two Killed — Habits of Wild Swan. The Water-Ouzel: Nest; Singular Habits; Food; Song of — Kingfisher: Rare Visits of; Manner of Fishing — Terns: Quickness in Fishing; Nests of. The Muckle Hart of Benmore. Different kinds of Gulls: Large Collections of — Breeding-places — Islands on a Loch — Eggs of Gulls — Young Birds — Food and Voracity of Large Gulls: Salmon-fry killed by — Boatswain-Gull - Manner of procuring Food. Woodcock's Nest: Early Breeding of; Habits of, in Spring; First Arrival of; Anecdotes of; Manner of Carrying their Young — Habits of Snipe — Number of Jack-snipes — Solitary Snipe. Seals — Destruction to Fish and Nets — Shooting Seal in River and Sea — Habits of Seals — Anecdotes — Seal and Dog — Seal and Keeper — Catching Seals — Anecdotes. The Badger: Antiquity of, Cleanliness; Abode of; Food; Family of — Trapping Badgers — Anecdotes —Escape of Badger — Anecdotes — Strength of — Cruelty to. 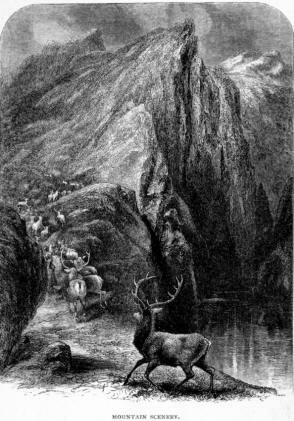 Autumn day on the Mountain — Stags and Hinds — A Bivouac — Death of the Stag.